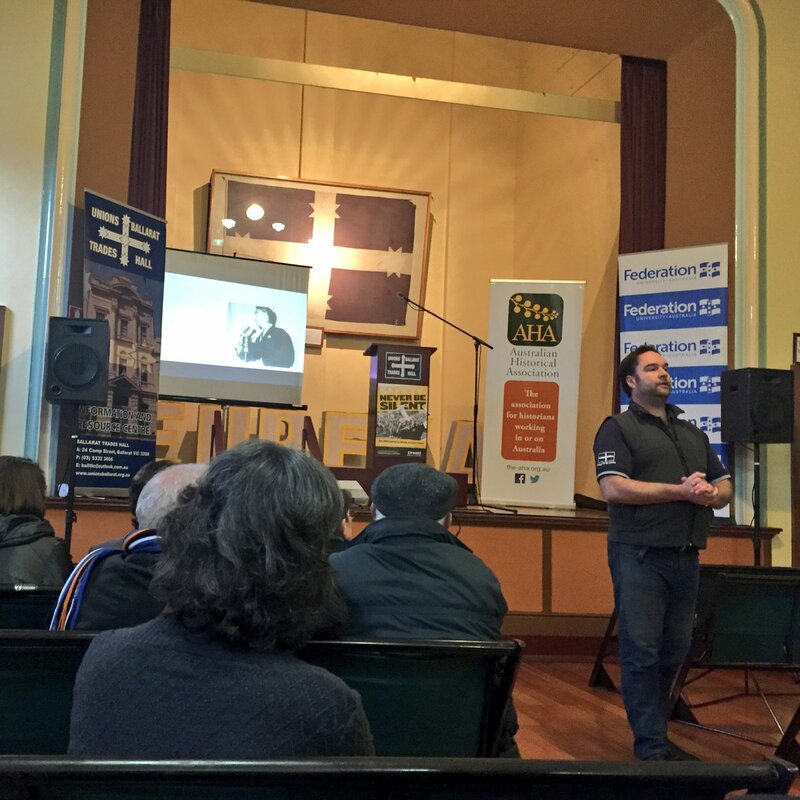 Brett Edgington leads a tour of Ballarat’s Trades Hall, the second oldest trade union council in the world. 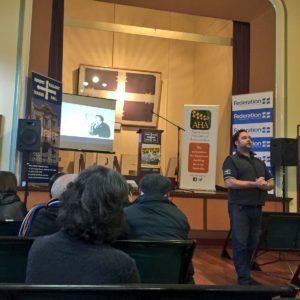 That Ballarat hosted this conference was a highlight for a few reasons. First, Ballarat is a seductive historic nineteenth-century city, a product of the Victorian gold rush and successive periods. Ballarat is just over 100 kilometres, a couple of hours drive, from my home town of Melbourne. Second, in the past few years Ballarat and its local municipal authority has been leading the way in urban heritage practice via the UNESCO Historic Urban Landscape (HUL) approach. I’m enjoying the fruits of the HUL efforts, particularly the rich online media that has been developed. 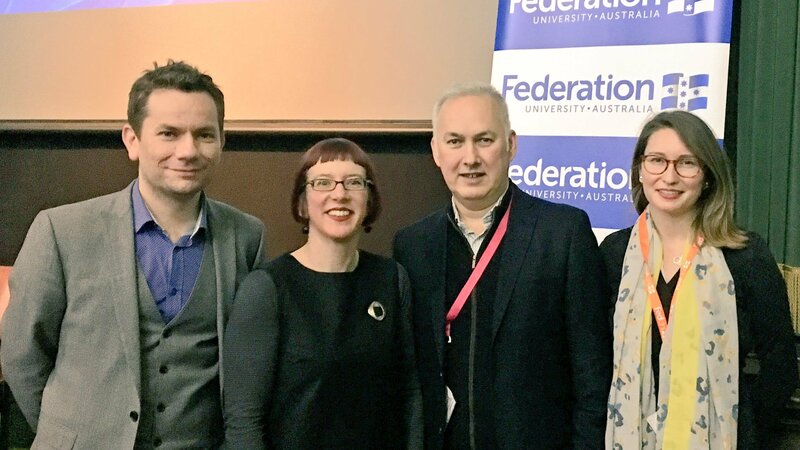 Third, the conference was hosted by the CRCAH (Collaborative Research Centre in Australian History) at Federation University . CRCAH has a strong urban and heritage focuses, which was reflected at the AHA conference. These dual focuses were emphasised in panels and plenaries, much to the delight of attendees like myself. I’ve summarised my notes from some of these sessions below. A highlight of the conference was the keynote from Adam Wilkinson , director of Edinburgh World Heritage. Stuart Macintyre, current chair of the Victorian Heritage Council, whose honours seminar on Australian history I took, introduced Wilkinson. Macintyre contextualised the Australian heritage movement, drawing from Graeme Davison’s canonical A Heritage Handbook (1991). I found Macintyre’s summary interesting. Particularly as I am working on a revisionist account of the Australian heritage movement in terms of cities. To preview my perspective: in my view, there were many older and varied impulses that fed the 1960s-70s Australian heritage explosion than have been previously accounted for. The conventional narrative, in contrast, has a somewhat narrower conception of heritage, which includes a notion that I contest: that Australia ‘came late to the heritage movement’. After Macintyre’s generous introduction, Wilkinson took the stage. Drawing on examples from his distinguished heritage career in the UK, Wilkinson’s perspective was practice orientated and therefore more contemporary in orientation. He questioned whether the ‘moral prerogative’ still existed, beginning with the British antiquarians, from Ruskin, Morris and SPAB and their ideas around object oriented preservation. He then moved forward to the 1972 world heritage convention, which came as the objective moral prerogative and its elitist conceptions of heritage were slowly beginning to fade. In 2016, Wilkinson argues that we need a more people orientated heritage perspective. And that those working in heritage must ‘hijack’ notions of value to ensure that heritage and preservation are part of achieving a greater ‘public good’. In other words, heritage is inescapably political and what we preserve is subjective, so let’s ‘use’ heritage to better our society. What Wilkinson meant in practice is that any identification of heritage by a professional or regulator involves politically subjective decision making. It does not matter what tradition is being employed. Whether it is an older nineteenth-century antiquarian tradition. Or a way that emphasises the identification of historical or architectural values as favoured in heritage practice since the mid-to-late twentieth-century. Or if we take a contemporary people orientated approach. The question comes down to how we see our cities and ourselves. For Wilkinson, the heritage moral prerogative is not dead but rather has changed. From his progressive perspective, he suggests that heritage and its preservation has a fundamental role in achieving more democratic and socially inclusive societies and cities; a powerful and politically engaged viewpoint. I was looking forward to this plenary on urban history. 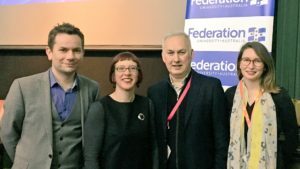 It provided an exceptional opportunity for the speakers to suggest what the relatively niche field of Australian urban history has to offer to the wider Australian historical community. I write this summary knowing most of the speakers: Andrew May and Simon Sleight (along with Kate Darian-Smith) are my PhD supervisors. And I first met Louise Prowse at the AHA conference in Adelaide in 2012 when we shared a session together, and we are both advocates for historically informed heritage practice. A fundamental issue of the plenary centred around questions of what a city actually is. The speakers were keen to emphasise that the city is not only a level of government or a physical site. But rather that the city is made of abstract interconnected socially produced spaces, where people, goods, capital and ideas circulate. The urban space that via social processes we understand as ‘the city’ is messy and can only be understood, now and in the past, through partial representations and myth making. Facts and figures, the hard city, tells only part of the story, meaning the soft city is equally important. May in particular emphasised that messiness should be embraced, because it is not just how the everyday world is actually experienced but also enables more inclusive histories, amongst other reasons. Drawing from her PhD research, Prowse sought to expand Graeme Davison’s idea of the Australian metropole to incorporate regional cities and small towns. From the City of Sydney, Lisa Murray brought a contemporary heritage perspective, identifying how urban history fosters local community making. Sleight drew connections between urban courting practices in the UK and Australian city to suggest the fruitfulness of comparative urban history. My takeaway from this session was the importance of transcending boundaries in historical scholarship and heritage practices. The speakers emphasised how urban history may be a particular sub-field with its own traditions, but also has much to offer for broader historical scholarship. It is also a powerful form of public history making; its debates relevant both for academic historians and also for the wider community, especially with the plethora of emergent digital techologies. Finally, and drawing from Doreen Massey, Richard Rodgers, Shane Ewen , Nicolas Kenny and Rebecca Madgin and others, cities were posited as fundamental to understanding our global historical and contemporary worlds and their interconnectedness. Put another way, cities are never discrete and demarcated entities, but rather, abstractly and practically, are brought about through social processes, connections and flows. For Australian historians, this is particularly relevant. It was a strong plenary, and like the Wilkinson keynote, the discussion continued on Twitter over the coming days, representing the extent of interest in urban history and heritage amongst Australian historians. There were various papers on urban history and heritage in the conference parallel sessions. I gave a paper on Australian skyscraper urbanism. In the same session David Nichols delivered a paper on a Canberra cities conference held during the late 1960s. It was part of the lead up to the fundamental shift to Australian urbanism which is generally dated to the early 1970s, aligned to Hugh Stretton’s Ideas for Australian Cities [see also my blog] and the Whitlam Government’s Department of Urban and Regional Development [see my blog]. As the audience noted, bringing our two disparate urban history papers together was productive in the historicising of the Australian city and its particular rendering of late modernist urbanism. I won’t summarise further papers as this blog is longer than usual. But I would encourage those readers that are interested to check out the AHA 2016 conference programme (PDF). The urban history and heritage sessions were just one subset of a diverse and well attended conference.